It's saffron harvest time here in the Lot. Known in France as l'or rouge, at 30€ per gram safran is the most expensive spice there is. This precious ingredient comes from removing and drying the stigmas of the mauve blue flower Crocus Sativus Linnaeus. The name saffron comes from the Arabic-Persian word za'faran, which describes the deep orange colour of the spice. All the way back in the 11th century, with all their comings and goings to the Holy Land, the Crusaders came across saffron and were the first to introduce it in France. At more or less the same time, during the Arabic occupation of the Iberian Peninsular, the cultivation of saffron became widespread in Spain. First appearing in the south of France in Provence and in the Albigeois, its cultivation eventually spread further northward. Quercy is the historical name for the area which is now more or less covered by the Lot. Here and in the Albigensian area, saffron cultivation occupied vast surfaces and up until the French Revolution knew such prosperity that its price was calculated by the quintal (100 old pounds, roughly equivalent today to 50 kilos). Its commercial scale was international. French soils provided a high quality saffron that was very popular with consumers as far afield as the Nordic countries, to the extent that saffron was one of France's most important exports, forcing the authorities to intervene several times to legislate on how it was cultivated, traded and taxed. Farmers would turn land usually intended for cereals over to saffron, in order to avoid paying tithes to their parish priest. By 1480 the stakes had become high enough to prompt King Louis XI to pass a law to control fraudsters. Saffron growing did not fill the agricultural calendar, due to its October harvest, but nevertheless required a large and specialized workforce. It was practised on small plots called safranié, safranier, safranière or saffranerio in Occitan, the language spoken in the South of France at that time. 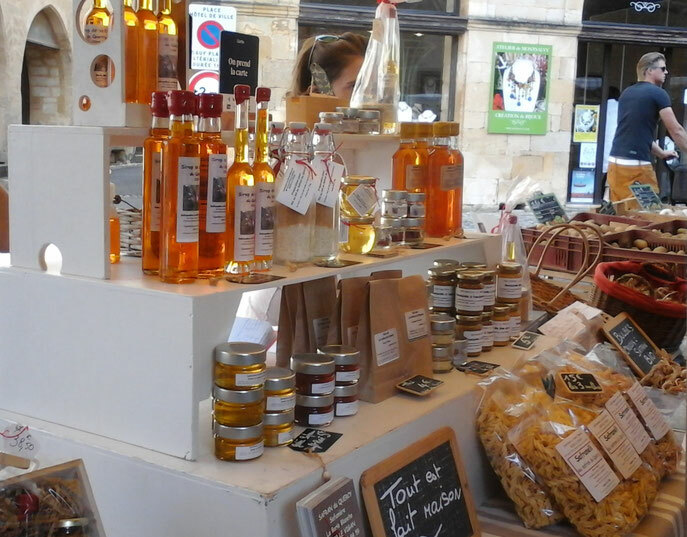 The quantity of saffron produced in Albigeois and Quercy accounted for nearly half of all French production. In 1589, King Henry III granted the creation of four annual fairs and a weekly market in Albas in the Lot. 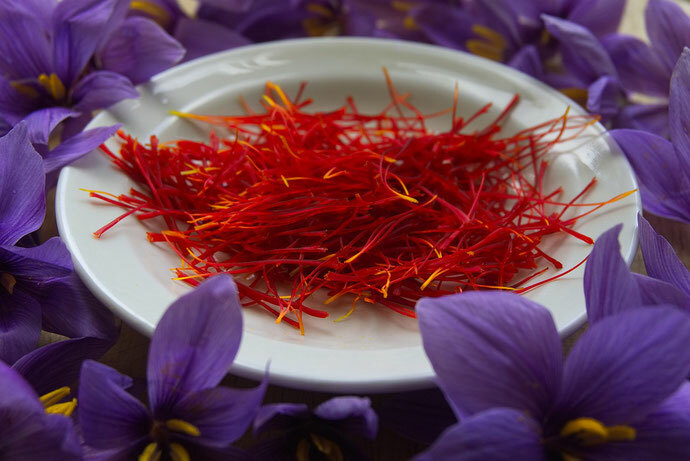 The production of saffron required a large and specialized workforce as well as careful cultivation. Very harsh winters wiped out crops. These factors, combined with the evolution of French agriculture, contributed to a sudden disappearance of saffron cultivation in the 18th century. After the Revolution, saffron survived in home gardens for domestic consumption. And here the story would have ended . . . if, twenty years ago, there hadn't been a surge in interest in growing saffron in the area. 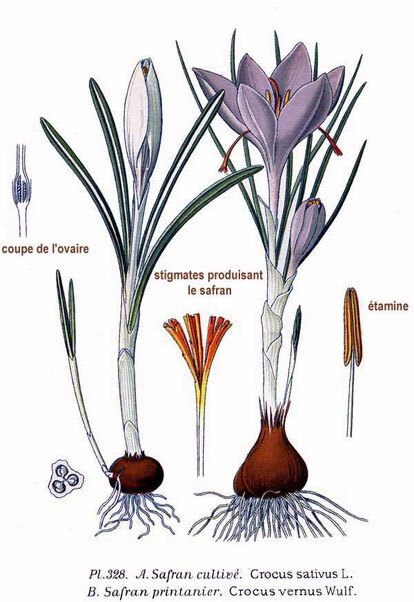 In 1997, some saffron bulbs were discovered in a sheltered vegetable garden near Cajarc, allowing its cultivation to be re-commercialized. Today the Quercy area once again produces high quality saffron. #1. Saffron needs time to develop its aromas and should be infused in a little hot water or in any liquid preparation related to your dish: stock, wine, vinegar, egg white, milk, cream. The recommended brewing time is 4h minimum but ideally up to 24h. You can then add your saffron preparation, along with the stigmas, just 10 minutes before the end of cooking. #2. You can put your saffron infusion into ice cubes for use in last-minute dishes. #3. Reduce the saffron to powder so that it mixes better with the liquid. Dry it slightly by placing the stigmas on a sheet of paper for a few minutes, near the open oven. Crush the stigma by crumpling the paper between your fingers. #4. Do not use wooden utensils as they are absorbent and will soak up the precious spice flavours. #5. Keep saffron in an airtight container, away from light. Crocus sativus & C. vernus, illustration by Amédée Masclef, from Atlas des plantes de France, 1891. Public domain. But forget the idea that saffron is a luxury reserved for the rich. Just one gram of saffron has enough potency to spice up more than 60 dishes, sweet and savoury alike. That means that 0.03 grams is enough for two servings! Fancy spicing up dinner tonight? For some inspiration, you could try looking for recipes here.